Exhibiting artists: Jo Shand, Niomi Sands, Clare Hodgins, Gina McDonald, Peter Read, Shelagh Lummis, Dino Consalvo. For the first time the gallery asks a group of artists to respond to the concept of 'what remains'. 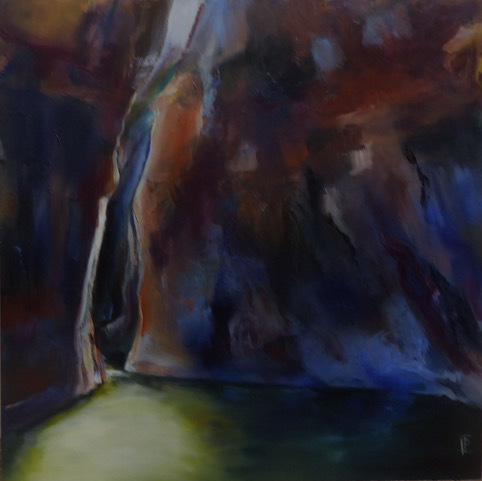 My series of paintings for ‘What Remains’ is inspired by a recent visit to the Kimberley region of Western Australia. Overpowering perceptions were of monumentality and timelessness. Hot sun intensified a bright landscape of reds, ochres and purples. The wet season’s flooding waters had withdrawn so that still pools and thin waterfalls were all that remained of the roaring torrents of previous months. As we slipped into the surprisingly icy water, I was struck by the stillness of the landscape which persevered despite splashing tourists and their yelling children. A somewhat sad event - a trolley left behind by accident, is the inspiration for the work Left by accident, 2017. The work pays homage to a trolley and its owner. The granny trolley left behind at the Glasshouse by accident by an elderly patron, it was full of shopping, most of which was perishable. The trolley sat in the back office for a number of weeks, awaiting its owner. Every attempt was made to locate its owner, even down to reporting it to the local police station. The work documents the process of trying to locate the owner and the gradual disposal of the perishable items. The events that unfolded around the trolley are recorded through a number of image and text based embroideries on to a series of plastic bags. Niomi Sands A few things, 2017, is a series of cross stitched designs embroidered into watercolour paper. 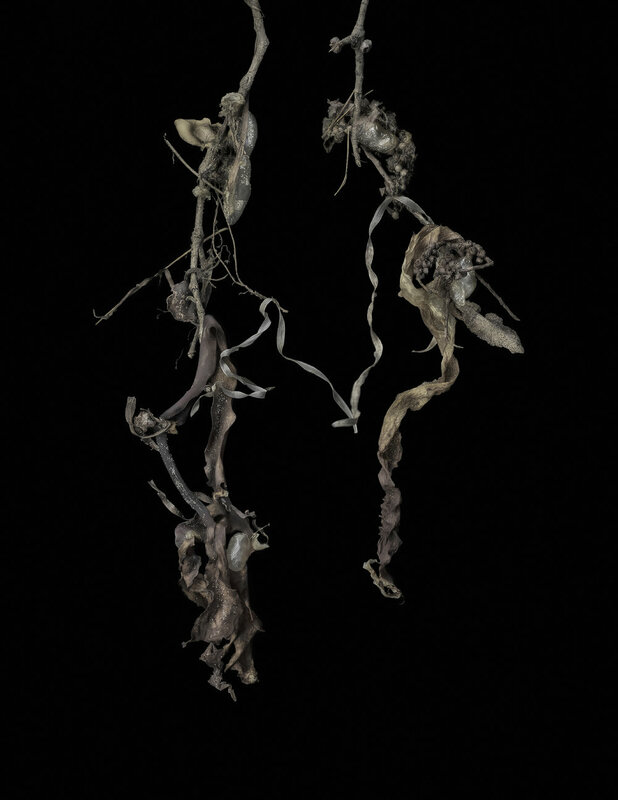 This collection of suspended dead and decaying specimens has been sourced from the ocean. The human element is absent in the photographs, however, the audience can project human qualities and emotions onto what they see. Viewers are invited to imagine and create connections between the various objects.